VATICAN CITY (CNS) — Global leaders must implement policies that support the family and offer real opportunities for the growth and development of all people, Pope Francis told people attending the World Economic Forum in Davos, Switzerland. “If we want a more secure future, one that encourages the prosperity of all, then it is necessary to keep the compass continually oriented toward ‘true North,’ represented by authentic values,” he wrote. “Now is the time to take courageous and bold steps for our beloved planet. This is the right moment to put into action our responsibility to contribute to the development of humanity,” he told corporate and political leaders. The pope’s message was read at the meeting Jan. 22 by Cardinal Peter Turkson, prefect of the Dicastery for Promoting Integral Human Development. The pope told world leaders and global executives that they must confront both new and lingering problems and challenges, such as unemployment, poverty, economic and social inequality, and new forms of slavery. “It is vital to safeguard the dignity of the human person, in particular by offering to all people real opportunities for integral human development and by implementing economic policies that favor the family,” he said. 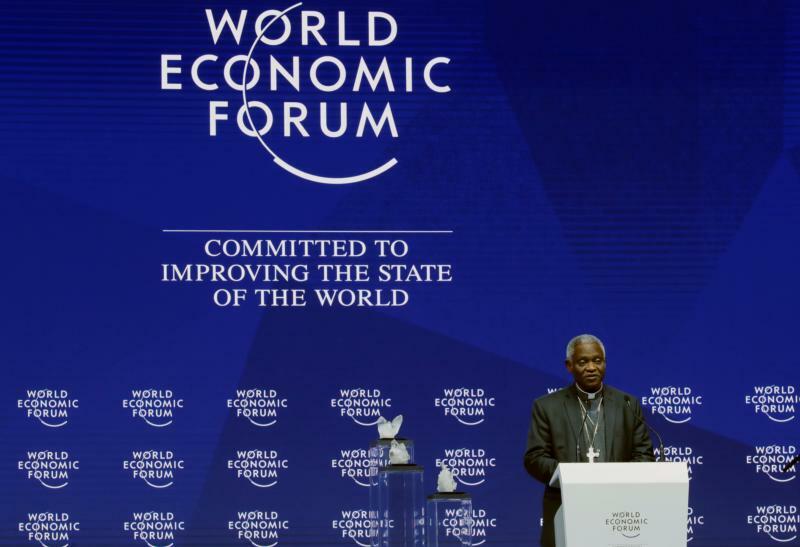 “By rejecting a ‘throwaway’ culture and a mentality of indifference, the entrepreneurial world has enormous potential to effect substantial change by increasing the quality of productivity, creating new jobs, respecting labor laws, fighting against public and private corruption and promoting social justice, together with the fair and equitable sharing of profits,” the pope said. “There is a grave responsibility to exercise wise discernment, for the decisions made will be decisive for shaping the world of tomorrow and that of future generations,” he added.